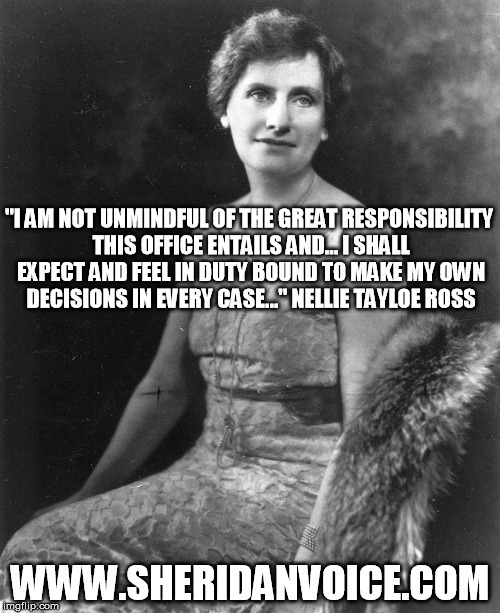 On this day, January 5, 1925, after the death of her husband, William Bradford Ross, Governor of Wyoming, Nellie Tayloe Ross is sworn in Governor of Wyoming after having been elected to replace him, thus becoming the first woman governor in the United States. 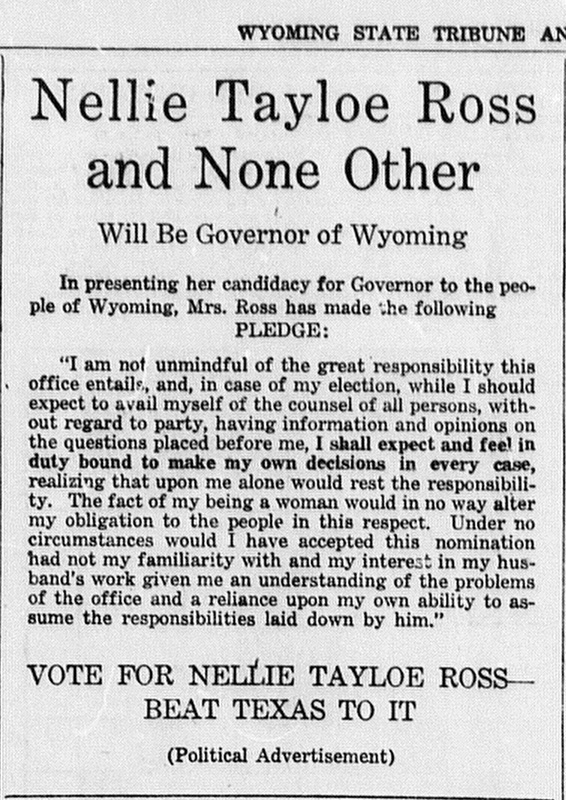 CHEYENNE, Wyo, Jan. 5, 1925 (UP) – Pledging herself to continue the program and policies launched by her dead husband, Mrs. Nellie Tayloe Ross was formally inaugurated governor of Wyoming at noon today. 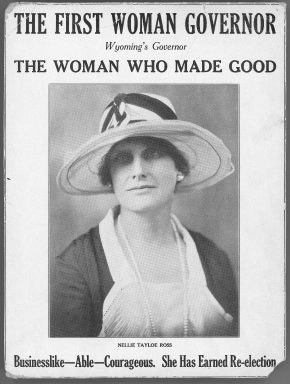 Mrs. Ross is the first woman governor in the history of the nation. The Senate chamber of the state Capitol, where the oath of office was administered by Chief Justice Nelson N. Potter, of the State Supreme Court, was filled to overflowing when Governor Ross entered. She was dressed in mourning and sat quietly on the rostrum while Governor Frank E. Lucas promised her the support of the present administration. Mrs. Ross spoke slowly and without noticing the battery of movie cameras turned upon her. In the audience were two of her sons, George, 21, and Bradford, 14. A third son, Ambrose, employed in Mississippi, was absent. Her inaugural address was in the form of a 250-word statement. She avoided any direct mention of political affairs, confining herself to words of appreciation for the honor conferred upon her and an acceptance of the challenge its responsibilities delivered to her. Owing to tragic and unprecedented circumstances which surround my induction into office, I have felt it not only unnecessary, but inappropriate for me now to enter into such a discussion of policies as usually constitutes an inaugural address. The occasion does not mark the beginning of a new administration but the resumption of that which was inaugurated in this chamber two years ago. It is well understood, I am sure, that it is my purpose to continue, as I am convinced it is the desire of my state that I should, insofar as changing conditions will permit, the program and policies then launched. I avail myself of this opportunity to acknowledge the gracious consideration shown me by Governor Lucas during the period he has served as chief executive of our state and to say that I look forward confidently to that same degree of cooperation with him and the other state officers and with the legislature, that during my husband’s term lightened for him the burdens of official life and contributed to his satisfaction and joy in service.